What is needed for the new Auckland is a structure that will ensure rural areas don't become urban playgrounds that are "protected" in a way that excludes any viable use. 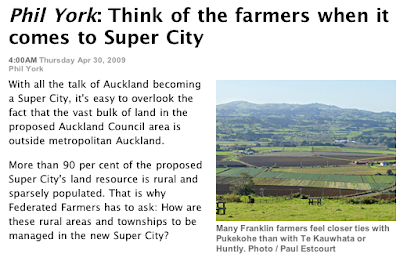 I note that last night Len Brown, Mayor of Manukau, said that he had no problems with Franklin being outside the super city - as is that council's wish. York: Farmers in the Rodney District already pay almost four times the amount farmers on equivalent farms in Manukau City pay, so an Auckland-wide rating system is hardly likely to result in higher rates for rural Rodney. Once inside the city Rodney and Franklin cannot control anything - their rates, their zoning - nothing. If the 90% or more urban councillors decide to turn the rural districts into parks and restrict uses to preserve "heritage" then they will not be able to do anything about it. 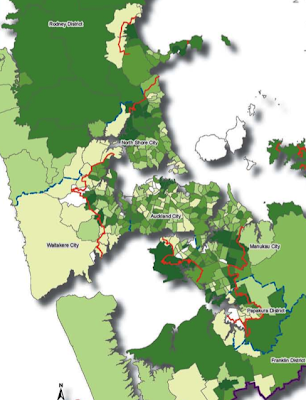 If they want to move the Metropolitan Urban Limit (MUL- see map below) out to Hellensville or out to Pukekohe there is nothing their one, two or three votes on the council can do about that. And if the council wants to encourage suburbanisation by hiking the rates on rural land to encourage subdivision then there is no stopping them.